Many bands are labelled cult artists from their followers, but few actually deserve that title, like for instance Sabbat from Japan. They started as a black thrash metal trio in the mid-Eighties, back then heavily influenced by Venom. Although the band has only recorded eight studio albums between 1991 and 2003, their official history consists of 140 items: 44 live albums, 41 EPs, 1 box set, 3 demos, 17 split releases, 3 DVDs and 3 video cassettes. And that’s only the last time I counted. At their busiest, they made it to nearly 20 releases per year! The Far East metal pioneers decided to re-release their longplayer Charisma (originally titled Karisma) from 1999, back then released as a Japanese language CD version and an English language vinyl LP. This is therefore the first time these tracks are available in digital format. It’s obvious from the beginning that Sabbat had back then already strongly evolved from their rather simple origins. Their music is sometimes described as samurai metal, but let’s face it: that’s just a label and nothing more. The seven tracks were at times rather expansive, with Den Of Hades more than twelve minutes long. 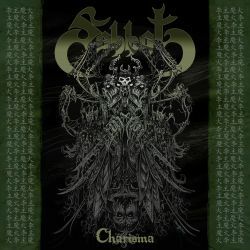 Sabbat skilfully combine brash old school black thrash like early Sodom and Venom with a narrative quality that finds room for melodic guitar leads and even occasional bass solos. The vocals are dirty, gritty and have a manically hysteric quality that give the songs the semblance of black metal fairytales. The album concludes with three bonus tracks taken from their albums Disembody, Karmagmassacre and Satansword. It’s especially the fifteen minute epic Nekromantik which once again displays perfectly the Sabbat’s uniqueness in the metal world. To celebrate the band’s twenty-fifth anniversary, Charisma comes with the additional tribute album 25 Years Of Black Fire – A Tribute To Sabbat, starting with a rare track from Sabbat’s first EP, followed by eleven bands from eleven different countries. Apart from Japanese metal band Metalucifer, founded by Sabbat’s bass player and vocalist Gezol, there are only obscure bands covering everything from thrash and black metal to groove rock. Some contributors could have done with a better recording quality though. The first disc is the vital one and should be warmly recommended to every fan of extreme metal. Even though Sabbat have been around for a quarter century and have released far over one hundred records, their music is still hard to find.